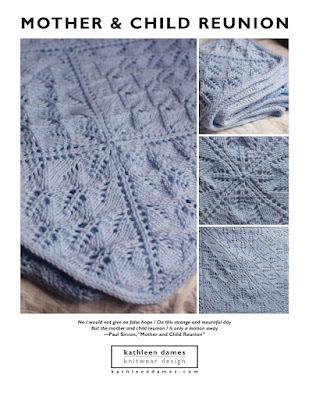 For those of you who haven't knit Clapotis, why not join us on the Second Wave KAL? And for those of you who've been with me for a while, yes, I did knit one before, but I couldn't resist when my friend Bridget started this one. Isn't my yarn pretty? I wanted to wait to take a picture until I'd dropped at least one stitch (the big exciting part of this pattern, you know). And now I have my new fall bag to show with it. I didn't even realize when I chose the brown over the red that it would look so nice with my shawl-to-be. And the skein of brown Koigu is to make a pair of Endpaper Mitts for my friend Keri's Fingerless Mitts for Fall KAL with the leftovers from Clapotis. I think I'll pause on the Clap, knit the mitts, and then finish the shawl with the rest of the yarn. What do you think? But then I also think I should go with a slightly more solid and light-colored yarn for the contrast. The Endpapers I've really liked in Ravelry have been high-contrast. Have fun in NY and your clapotis is looking fab!